Suleiman Haruna, Abuja: Beneficiaries of the Future Assured women and youth empowerment programme in Taraba state have commended the wife of the President, Mrs. Aisha Muhammadu Buhari for providing them with means of sustainable livelihood. The commendation was made at the indoor hall of the Jolly Nyame Stadium, Jalingo stadium on Wednesday, December 27, 2017. It would be remembered that the empowerment programme was initiated to contribute to the reduction of poverty among women and children. The empowerment programme of Future Assured involves skills acquisition training, start-off support after training, expansion support for existing small time businesses and provision of materials like Keke NAPEP. Mrs. Buhari in her remarks at the occasion stated that the support of women and youth has been the backbone of the administration of President Buhari, therefore showing appreciation from time to time is necessary. “I am distributing Keke NAPEP, sewing machines and spaghetti spiralizers for those at the lowest rung of the ladder to enable them start off and live normal lives. I am also supporting small time businesses with cash to enable them expand.” She said. The event attracted many groups in the state, whose members formed the majority of the beneficiaries. Hon. 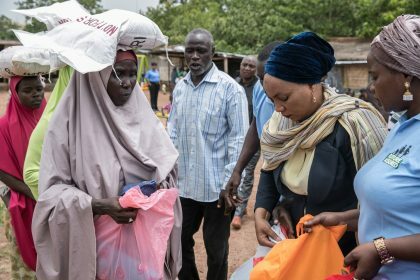 Ahmed Rufai Abubakar, who represented Mrs. Buhari at the event called on the beneficiaries not to part with the items even under pressure, saying that if they manage small beginnings, they will receive bountiful results in the future for the betterment of themselves, their families and their community. Other dignitaries who spoke at the event include the former Deputy Governor of Taraba State, Alhaji Uba Maigari Ahmadu, who commended the effort of Mrs. Buhari for supporting the ideals of the Federal Government to reduce poverty; and Senator Joel Ekenya who called on well-meaning Nigerians to emulate Mrs. Buhari’s gesture.